Teal, or specifically Teal Sequins (yip, that is an actual colour not just a thing) was the colour of the month for the White With 1 June challenge. As with last months black, I went through my ever decreasing stash and pulled out everything that was in the teal family. I don't have a ton of stuff, but I did have a ton of fun. I've always loved the colour but haven't really ever used it. 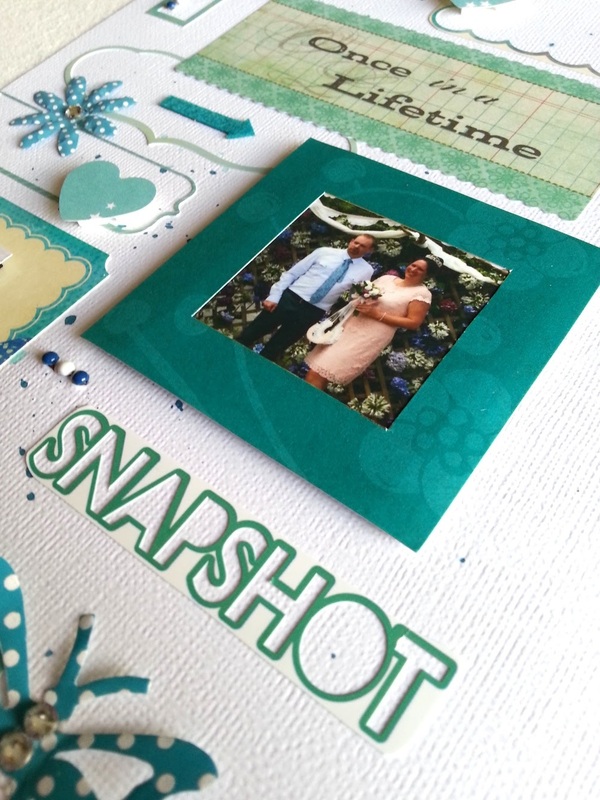 I found a frame in my stash that I have had pretty much since the start of my scrapbooking about 10 years ago (I have gone through my stash a few times giving away lots of bits and pieces but I have always held onto this frame as I love the colour a thought I would use it one day). The frame measures just under 3 x 3 inch with the inside being 1 3/4 x 1 3/4 inch and I lay that down on my blank page first. 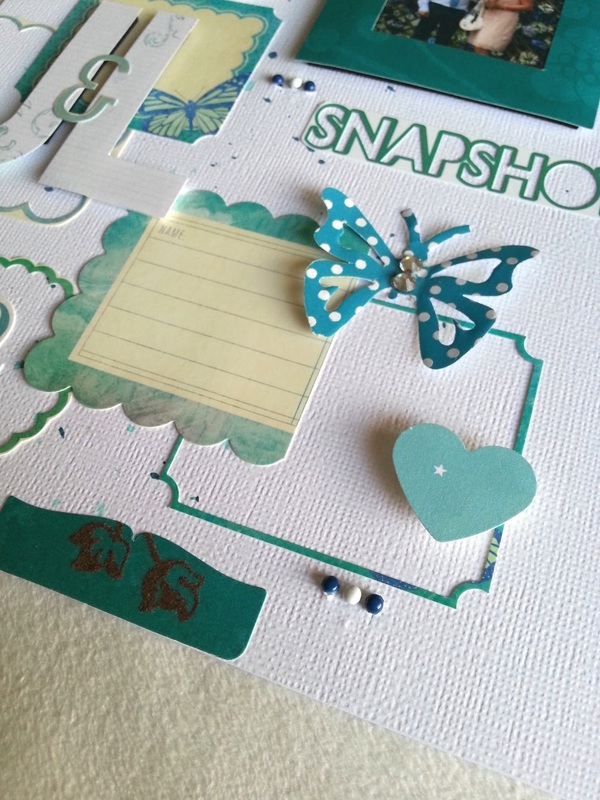 I then went through and pulled out all my frames and tags and lay them on the page and I loved how it looked. Of course I played around with it for a long time, changing bits here and there but the frames is what I stayed with. I then found a photo to match (not how I typically do a page). The photo is from my wedding - yip, I got married this year :-) I was planning on only putting up wedding pages when my album was finished and just showing a whole lot of wedding stuff at once, but I forgot about that - only remembering when I took photos for my blog post! Too late now, as this was my challenge entry! The photo is tiny, so it's just a little snapshot of my day - much more to come! All of the little frames are stickers, and they are actually fussy cut from around the label or tags on a sticker sheet. Yes I keep everything if I like it! I have pretty much made an entire page out of what other people throw in the bin. Some teeny tiny brads, teal ink splatters and punched hearts complete my page. Once in a Lifetime - I've had that sticker in my stash for a little while and finally found a use for it. 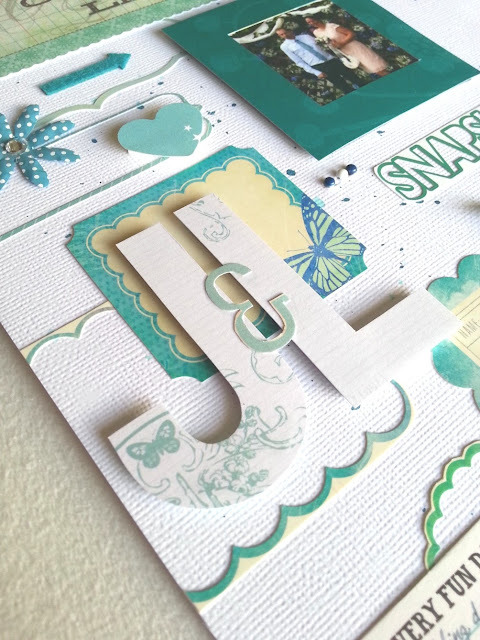 I have a whole bunch of things to show from my special day, but I've been crafting up a storm recently so have a whole pile of layouts and cards to show you first. I was asked to make a set of cards, which for some reason I really struggled with and they took me a couple of weeks to get done (a few hours here and there, not all day everyday!) and when I was done with them I wanted to do layouts only for a few days. Well I made one every day for seven days, did some sewing projects, made more baby boy cards (yip, every baby I know that has been born this year is a boy) and then made more layouts. That's about six more layouts than a typical month for me. I just wanted to get some photos done. Not every layout has to be perfect, they just have to be meaningful and tell a story. And fast. I've also been watching You Tube videos and getting all inspired to do some mixed media backgrounds. So stay tuned! And of course, thank you so much for stopping by today. If you like what you see, I do a blog post every Tuesday so stop by again next week. 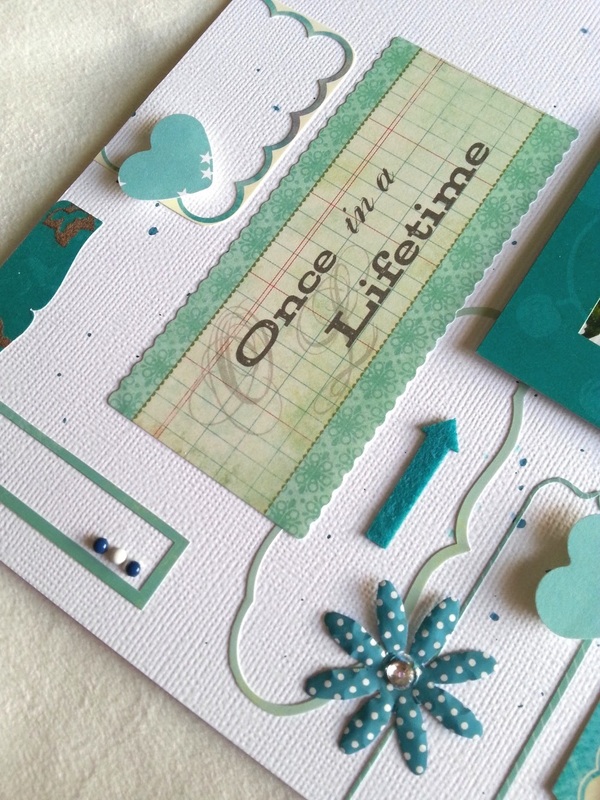 What a sweet layout and well done on using scraps! I really like your use of white space on this page! I really like how you have combined all the elements on your background. The page design is brilliant, it just works! Very clever!! Thank you so much for joining in with Ww1 this month. Oh Jessica you clever girl keeping what we all throw away!!! I love how you have used them on your layout. Thanks for joining us again at White with 1.